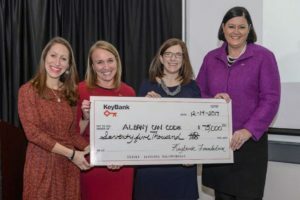 KeyBank announced it would be providing a $75,000 grant to the organization through its charitable foundation, money that will go to support AlbanyCanCode’s employer engagement program. AlbanyCanCode, the Troy nonprofit focused on creating a new generation of local software coders, recently received two holiday presents. And AlbanyCanCode also announced that it will launch a new class at Hudson Valley Community College, the first with the Troy-based school. AlbanyCanCode already runs two classes at Schenectady County Community College and has always hoped to offer classes at HVCC as well. “We are very excited about our partnership with AlbanyCanCode and look forward to strengthening our workforce development presence within the community,” said MaryAnn Janosik, interim vice president for academic affairs at HVCC. The KeyBank grant goes a long way for AlbanyCanCode, which relies on corporate support and government grants for its programming, which has included workforce training, college courses and K-12 education. AlbanyCanCode was created due to a huge demand for software engineers and coders, jobs that are difficult to fill in the Capital Region due to a lack of people trained in writing software. Because of that, finding coders can be an expensive proposition and leads some firms to hire for the positions in other cities. The employment engagement program helps connect employers with qualified candidates and do planning with local companies seeking software engineers. Coding jobs can pay between $50,000 and upward to $100,000 depending on the skill level. “Thanks to this grant, in 2018 we’ll have a template of employer engagement programs to bring more consistent and meaningful involvement from those who will ultimately benefit from our work—local technology companies,” said Janet Carmosky, executive director AlbanyCanCode and a co-founder of the organization. KeyBank, the region’s largest bank and one of the area’s biggest corporate philanthropists, has a history of investing in workforce development with major employers such as Albany Medical Center. “At KeyBank, we support organizations and programs that prepare individuals for thriving futures,” said Kelli Arnold, director of corporate responsibility at KeyBank. The HVCC course will be on what is known as automated testing, a job at software companies in which a coder tests a software app for glitches as it is rolled out and updated. Carmosky said such tester skills are ideal for teaching in a community college course. Automated testing uses a system known as Selenium to find programming mistakes. “It’s for patient, methodical people,” Carmosky said. The course is expected to be offered in the spring, with a cost of $400 per student. Aaron Caton, who works at a Underwriters Laboratories in Latham, will teach the night class.